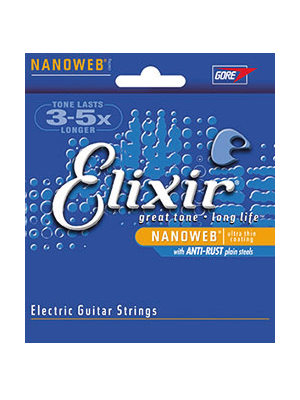 Back in 1997, Elixir launched a product that was to change forever the way guitarists looked at that most humble (yet vital) of accessories, the string. Taking steel strings and covering them in an ultra thin polymer coating meant that Elixir was able to achieve that which many before them had tried and failed to do – produce a long life, coated string that retained all of the tonal clarity and resonance of the string, whilst immeasurably extending its lifespan. Since then, Elixir has gone on to become a name familiar to fretted instrument players across the world, thanks to its brilliant innovations and pioneering use of wire coating technology. 2001 saw another leap forward for the brand, as an even more advanced, anti rust Nanoweb coating was developed, ensuring that players could get even more longevity out of a set of strings than ever before. By ensuring that all the sweat and dirt that normally accumulates on an average guitar string is kept away from the surface of the steel string itself, yet at the same time ensuring no compromise in tone, Elixir hit the jackpot again. Since its first foray into the string market, Elixir has consistently worked to provide solutions to the biggest problems guitarists face – problems that have been overlooked since the very earliest days of the electric guitar, such as poor quality cables affecting sound quality, or rusty strings not lasting two nights – and will no doubt remain the first choice for gigging musicians all over the world.